It was those fantastic, heroic tales and historical glimpses that have stayed with me, finally coming forth to blend with the skills and interests I’ve acquired through the years. Typical of her generation, aunt Mame was a conservative Catholic and a Goldwater Republican, yet she also was concerned with the environment (I inherited her extensive library, which includes a first edition of Silent Spring). 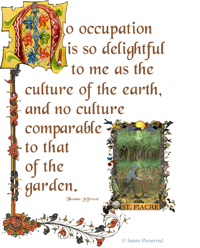 She loved animals and gardening and in part was the inspiration for my St. Roch and St. Fiacre. I include flora and fauna in all my pieces. A dietitian by profession, Aunt Mame was more scientist than artist. However she was terrific with food presentation (I also inherited a first edition of The Joy of Cooking) and caused a stir when she insisted on having such radical food as whole grain bread and mixed salad greens in the hospital cafeteria in the early sixties (the white‐bread years). I dedicated the St. Martha Anachron to my Aunt Marie. I still talk to her and I know she is listening.